For a bride and groom on a budget, sterling silver wedding bands and rings offer an inexpensive but chic option. With styles ranging from simple bands to ornate designs using cubic zirconia and other decorative stones, the range of options available ensures that it is possible to find a band or ring that suits both the bride’s and groom’s style. For brides, the number of wedding bands and rings available in sterling silver is astonishing. For simple wedding bands, it is possible to purchase one for just over $10.00, though options can reach the $60.00 range for a band depending on engraving. A popular option is to have a special message related to your wedding day engraved on both the bride’s and groom’s bands, thereby personalizing them. Sterling silver is easy to engrave, though you will need to make sure the band is wide enough. For brides, bands are often just 2mm wide, which is beautiful and dainty but not easy to engrave. And while a 2mm band may be appropriate for a bride with small hands, if your hands are larger, you will be better served with a slightly wider band, which will actually make your fingers look smaller. Sterling silver wedding rings can be purchased which feature gemstone accents. These typically cost anywhere from $100 to $200. Use of real diamonds will further raise the cost, and many options are therefore set with cubic zirconia. It is also possible to purchase sterling silver bridal sets, which range in price from $300.00 to $700.00 depending on stone setting and other details. For a sterling silver cubic zirconia bridal set, the average cost is $300 to $400. 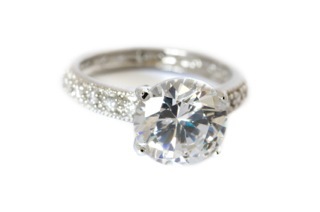 This holds true for bridal sets which use real diamonds of small (1/6 carat or less) weight. Bridal sets in sterling silver incorporating multiple or larger weight diamonds tend to cost between $400 and $700, though the brilliance of the diamond will be less at this price than what you could purchase set with a laboratory made diamond (cubic zirconia). If you prefer yellow gold to sterling silver, there are many options that feature yellow gold plated over sterling silver. This provides the richness of yellow gold without the expense typically associated with it, and pricing options are similar to those of sterling silver alone. When selecting your sterling silver ring or bridal set, consider carefully how you will wear it. Although a large, square cut stone in the center of the ring may be beautiful, will it work with your lifestyle? These rings are meant to be worn for a lifetime, and as such, you should consider carefully the style of the ring. Will it snag on sweaters? Make searching in your purse for your keys more difficult? If the answer is yes, you might want to examine other options. It is also important that the wedding ring fit properly. Even bands can be impossible to resize if their pattern (such as a weave) is intricate or they have been inlaid with stones around the entire band. If you have doubts about the fit, ask the jeweler who is helping you, and verify if the band can be resized before purchase if you’re still not sure. If you think water retention or other issues might be affecting how the ring fits that day, ask the jeweler to hold the ring so that you can come back the next day and try it again. Don’t be in a rush to select this symbolic piece of jewelry. Typically, sterling silver wedding bands for men will cost anywhere from $18 to upwards of $200, depending on the band’s details. A beveled band or satin finish band will typically cost $20. These bands offer simple details to enhance the silver’s appearance. Other finishes, such as millgrain and brushed rows, will cost in the $70 range. There are also a number of options which utilize sterling silver as an inlay for a titanium or tungsten carbide ring. While these are striking options, they will typically raise the price of the ring significantly—upwards of $100 for titanium and $300 for tungsten carbide. However, they are incredibly durable metals that will add luster to the sterling silver inlay details. Most sterling silver wedding bands for men range in size from 7mm to 8mm, though thumb ring bands (an unusual but not unheard of option) are often 10 mm in width. The width of the band should be selected based not only on the band’s design—a weave pattern will require a greater width than a plain finish typically—but also on the size of the wearer’s hand and fingers. Smaller hands typically do not wear larger rings as well as larger hands do, and vice versa. Consider this when trying on the band, and focus also on the level of comfort you feel with the band. It should neither pinch nor slide off. As some bands cannot be resized due to design (such as the aforementioned weave pattern) or inlay (diamond or cubic zirconia inlays around the band), it is important to get a proper fit the first time. Websites such as Amazon.com and Overstock.com feature a large selection of wedding bands, rings, and bridal sets in sterling silver. InspiredSilver.com is another site with plentiful selections and reduced prices. Make sure that you verify that the band can be resized before you purchase it online, though. If your ring size is typically a size 6, that doesn’t mean it won’t be a 5 or a 7 on occasion. Just like the jeans in your closet (three different sizes for three different pairs), ring sizes can be fickle. Stores such as JCPenney frequently place their sterling silver wedding rings, bands, and bridal sets on sale. You can check online for options before heading to your local mall. Many local artisan jewelers stock sterling silver wedding bands, rings, and bridal sets, and some will make custom designs (though these tend to raise the price). It is also possible to order unique selections from local jewelers with access to wholesale retailers that chain jewelers may not patronize. Buying sterling silver wedding bands, rings, and bridal sets is an excellent way to maintain the elegance of your wedding day without breaking the bank. Many gold or platinum bands alone can cost $1000 each, and bridal sets can cost upwards of $3000. Selecting sterling silver, with its durability and classic finishes, is an easy way to stay within budget and still have a beautiful reminder of your wedding day.